Star Wars. The name evokes billion-dollar blockbusters, a film franchise that has last more than forty years. For most people, Star Wars is the Star Wars films—that one with the teddy bears, the ones with Darth Vader and the lasers swords, with Yoda. But Star Wars fans and Lucasfilm payroll know better and for forty years have developed Star Wars as a media brand and transmedia franchise, branching the galaxy far, far away out across every media thinkable and expanding its storyworld to thousands of intellectual properties manifest in dozens of video and analog games, thousands of comics, hundreds of novels, uncountable toys, and, of course, multiple television shows. Star Wars TV: Transmedia Worlds, Franchise Politics, and Televisual Culture seeks essays that offer critical insight into the televisual culture and transmedia politics of the Star Wars franchise as it spread across TV beginning with the Star Wars Holiday Special in 1978 and continuing to the present array of shows in the Disney era. 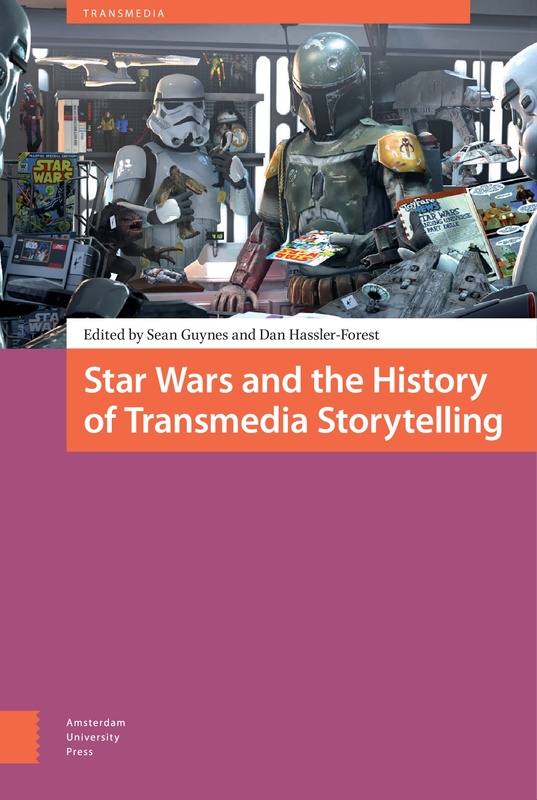 This collection takes as its basic premise that the televisual entrants into the Star Wars transmedia storyworld are both important texts in the history of American and global media culture and also key to understanding how the Star Wars media empire—and, thus, industry-wide transmedia storytelling strategies themselves—developed. Previous work on Star Wars has emphasized the films, fandom, Campbellian myth criticism, and occasional discussions of storyworld expansion in games, comics, and novels, while charting the politics of race, gender, sexuality, and imperialism in individual texts. Star Wars TV expands previous work on the transmedia franchise to consider television studies and sharp cultural and political criticism together in an effort to bring long-ignored texts, like the Holiday Special and the 1980s Droids and Ewoks cartoons, and long-running popular series, like The Clone Wars, to bear on the franchise’s complex history, storyworld, and politics. Potential chapter offer argument-driven readings of any of the Star Wars TV movies, series, or shorts: Star Wars Holiday Special (1978), Caravan of Courage: An Ewok Adventure (1984), Ewoks: The Battle for Endor (1985), Star Wars: Droids (1985-1986), Star Wars Ewoks (1985-1986), Star Wars: Clone Wars (2003-2005), Star Wars: The Clone Wars (2008-2014, 2019-), Star Wars: Rebels (2014-2018), Star Wars: Forces of Destiny (2017-2018), Star Wars: Resistance (2018-). Please do not feel limited by these potential topic examples. Chapters should represent the diversity of disciplinary interests in television, (trans)media, science fiction, and Star Wars studies as these areas of inquiry intersect with diverse issues in race, gender, sexuality, and (American) cultural history. For consideration in this collection, please send a 250 word abstract and CV by December 17, 2018 (Subject line: Star Wars TV — SURNAME). Files should be emailed to both editors, Sean Guynes-Vishniac (guynesse@msu.edu) and Derek R. Sweet (sweede01@luther.edu), in Word or PDF format. Notification of acceptance will go out no later than January 18, 2019. First drafts (6,000-8,000 words) will be due June 1, 2019. Sean Guynes-Vishniac is a PhD candidate in English at Michigan State University. He is editor of Punking Speculative Fiction (a special issue of Deletion, May 2018); co-editor of Unstable Masks: Whiteness and American Superhero Comics (The Ohio State UP, forthcoming) and Star Wars and the History of Transmedia Storytelling (Amsterdam UP, 2017); editor of The SFRA Review; and book reviews editor of Foundation: The International Review of Science Fiction. Derek R. Sweet is an Associate Professor of Communication Studies at Luther College who writes and teaches about the intersection of rhetoric, popular culture, and politics. His recent book, Star Wars in the Public Square: The Clone Wars as Political Dialogue, positions the animated series as an important cultural voice in ongoing deliberations regarding U.S. post-9/11 war efforts. Star Wars TV will be submitted to academic publishers that have established reputations for publishing in television and media studies.